We produce demos. We also offer top quality in studio instruction in radio and television commercial voice-over, documentary and corporate narration, cartoon voice and studio protocol. All Voiceworx Instructors are professional performers, directors and producers who make their living in the performing arts. Participants can expect top quality in-studio instruction in radio and television commercial voice-over, documentary and corporate video narration, character multi-voice, and studio protocol, in a state-of-the-art recording studio environment. Class size is kept to a minimum and Performers receive valuable in studio personal instruction behind the microphone. All materials are supplied and personal voice work is recorded to mp3 file for home review, complete with instructor's comments. 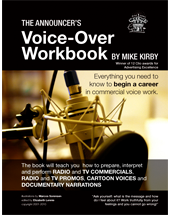 Everything you need to know to begin a career in the commercial voice-over industry. Learn how to prepare, interpret and perform commercial voice copy under the intense pressure of the studio recording session. Buy the book now and start learning from home.